I am pleased to relate that we have had another successful year at the Medical Wilderness Adventure Race series. 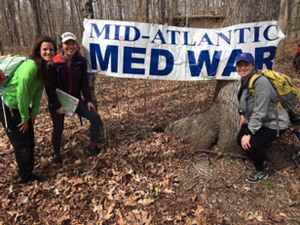 This past March we sent a team of 3 EM-bound UMKC students (Jordann Dhuse, Maggie Kirwin, and Allie Reinbold) to the Mid-Atlantic MedWAR in Newport News, Virginia. The “HAPE Apes” ran a 15-mile race of orienteering, mountain biking, and canoeing, completing wilderness medicine scenarios and knowledge questions along the way, and came in 5th place out of over 20 teams. This is a tremendous accomplishment, and demonstration of the strength of our School of Medicine & EM Residency. 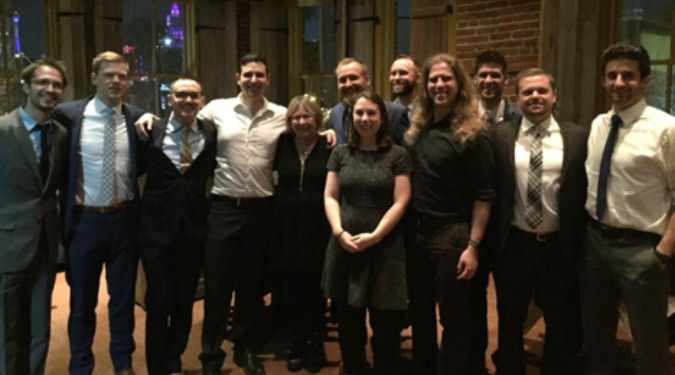 Be sure to congratulate these future EM docs on representing us so well in competition! On April 5th our senior residents all presented their research projects. Dr Tintinalli was guest of honor and speaker as well as one of the judges of the event. Dr. Tintinalli is a professor and founding chair of the Department of Emergency Medicine at the University of North Carolina at Chapel Hill. She also is an adjunct professor in the Department of Health Policy and Management in the School of Public Health, and in Medical Journalism in the School of Journalism and Mass Communications at the University of North Carolina. She received her medical degree from the Wayne State University School of Medicine. She completed residency training and received her Master’s in Clinical Research Design and Statistical Analysis from the University of Michigan. Dr. Tintinalli was president of the American Board of Emergency Medicine (1989-1990), was the founding president of the Council of Emergency Medicine Residency Directors and was chair of the Liaison Residency Committee (forerunner of the Accreditation Council for Graduate Medical Education-sponsored Residency Review Committee). She is editor in chief of the world’s largest selling emergency medicine textbook, “Tintinalli’s Emergency Medicine,” now developing the ninth McGraw Hill edition. The seventh edition received the Best Surgical Book of 2011 title from the British Medical Association. The residents had excellent presentations and 5 had abstracts accepted to the UMKC annual Vijay Babu Rayudu Quality and Patient Safety Day. Tony Toigo, D.O. won the Elenbaas Award for best project. Dr Tintinalli generously signed and “personalized” a copy of Tintinalli’s Emergency Medicine for each resident and presented them at a dinner after the presentations. Over the summer, Dr Muelleman was elected President of ABEM. He is the 2nd TMC/UMKC SOM Emergency Medicine graduate to be elected to, arguably, the highest post in Emergency Medicine in the USA, joining Mark Steele who was president some years ago. Medical school: University of Nebraska Medical Center 1980-4. EM residency: Truman Medical Center 1984-7. Research Fellowship: Truman Medical Center 1987-8. 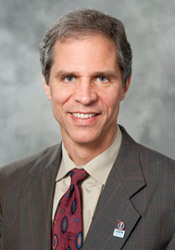 Associate Professor EM, Research Director: Truman Medical Center 1993-98. Section Chief EM: UNMC 1998-2006. Founding Chair EM: UNMC 2006-16. We wish Dr Muelleman well in this new post and know that ABEM is being led by one of the best! 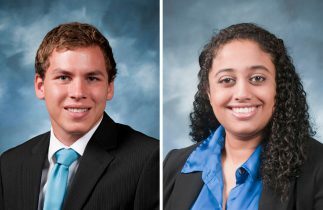 Two UMKC medical students have won new research awards for students interested in orthopaedic surgery. Corey Wells, a fifth-year B.A./M.D. student, is the first recipient of the University Orthopaedics Trauma Research Opportunity and Scholar Award. The award is given to an outstanding UMKC medical student intent on pursuing a career in orthopaedic surgery who demonstrates an interest in fracture care or management of traumatic injuries. The $1,500 award is designed for B.A./M.D. and M.D. students in the final three years of their respective programs. Recipients are expected to commit two consecutive elective months to a research project. The UMKC Department of Orthopaedic Surgery sponsors the award. Jonathan Dubin, M.D., assistant professor of orthopaedic surgery, said the department started the award in response to student interest in research opportunities. “A lot of them are really great students, and we wanted to be able to set something up where we give them dedicated, actual time to do the research and a reward for their achievements,” Dubin said. The scholar award will be drawn from a charity fund supported by orthopaedic surgery faculty members. Wells will work with Dubin, who specializes in orthopaedic trauma. Sanju Eswaran, a fifth-year B.A./M.D. student, will receive the University Orthopaedics Hand Surgery Research Opportunity and Scholar Award. She will assist Amelia Sorensen, M.D., assistant professor of orthopaedic surgery, with research projects relating to informed consent and infections. Sorenson, a hand surgeon, said she created the $500 award after seeing the quality of the applications for the University Orthopaedics Trauma Research Opportunity and Scholar Award. “I thought it would be a good use of my research money right now,” she said. The UMKC Department of Orthopaedic Surgery worked with Larry Dall, M.D., and Michael Wacker, Ph.D., assistant deans for student research, to develop the scholar awards. Wacker invited other UMKC academic departments interested in creating research awards for students to contact him or Dall. “We want to make inroads into every specialty that has interest in it,” he said. Two medical students traveled to Mexico City to present research at the World Congress of Cardiology and Cardiovascular Health. Fifth-year B.A./M.D. 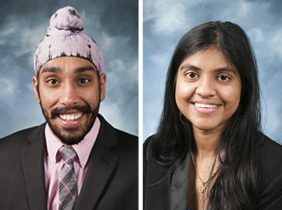 students Himachandana Atluri and Amit Nanda are co-presidents of the Cardiology Interest Group. They worked with Akshit Sharma, M.D., an internal medicine resident at UMKC who led a study of patients with non–ST elevation myocardial infarction, a type of heart attack. 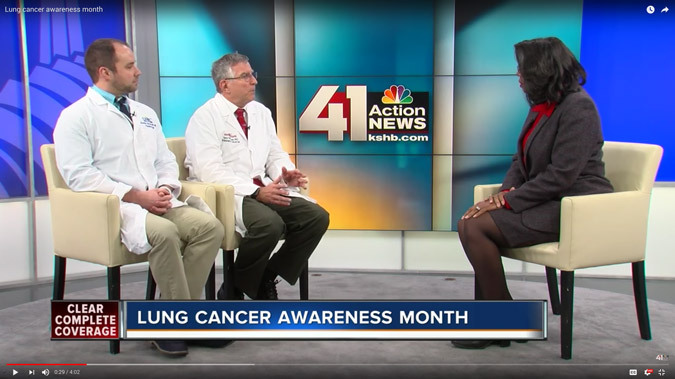 The study is a chart review of 425 patients treated at Truman Medical Centers who met the criteria. The authors identified a high incidence of new regional wall abnormalities in patients who underwent cardiac catheterization. Atluri and Nanda met Sharma through Javed Ashraf, M.D., M.R.C.P., M.P.H., an associate professor of internal medicine who mentors the Cardiology Interest Group. The students traveled with Sharma to Mexico City to present the research poster at the June 4–7 cardiology conference. Dany Jacob, M.D., a cardiology fellow at UMKC, is also co-author. The paper will be published in Global Heart and in the Mexican Society of Cardiology’s Archivos de Cardiología de México. Medical student Sachin Nair was accepted into a yearlong research enrichment program at the National Institutes of Health. 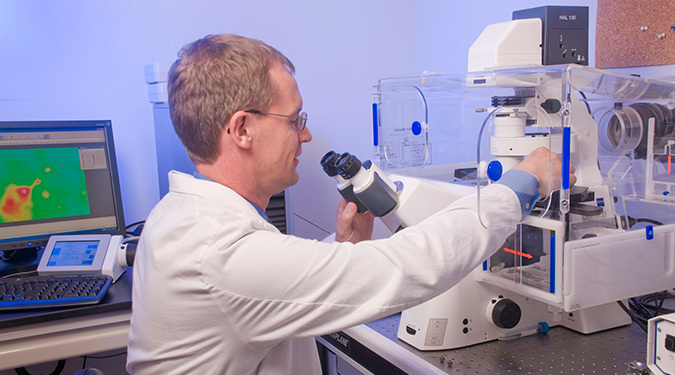 The NIH Medical Research Scholars Program enables medical, dental and veterinary students to participate in basic, clinical or translational research on the main NIH campus in Bethesda, Maryland, or at other NIH facilities. Nair said he is interested in the application of engineering and mathematical concepts in medicine. He will work with an assigned mentor at the NIH to find a lab. This process will take place through August, the program’s first month. Around the time of his NIH visit, Nair was offered a spot in a two-week summer course in computational neuroscience at the University of Columbia-Missouri. Sponsored by the NIH’s BRAIN Initiative, the program runs June 6–17. Admitted into the B.A./M.D. program in 2012, Nair will spend a year in the Medical Scholars Research Program. When he returns to UMKC next summer, he will join the Class of 2019 for his final two years in the combined degree program. Nair thanked Michael Wacker, Ph.D., assistant dean for student medical research; Paul Cuddy, Pharm.D., senior associate dean for academic affairs; and Dean Steven L. Kanter for the support and guidance he received. “I look forward to conducting a year of research at the NIH and I hope it will help provide me valuable experience and a strong foundation to later pursue a research-oriented career,” he said. 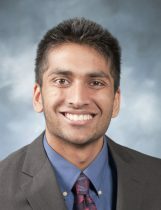 Nair is the third UMKC medical student to be named an NIH Medical Research Scholar. 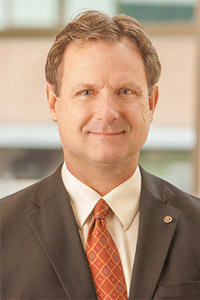 Dean Merrill, a four-year M.D. student, is one of 55 students in the current crop of scholars. Blake Montgomery, a B.A./M.D. student in the Class of 2016, went through the program in 2013-14. Joining Nair in using 2016-17 as a research year is Omar Karadaghy. A fifth-year B.A./M.D. student, Karadaghy will take part in a 12-month clinical and translational research experience at Washington University in St. Louis. — Muhammed Alikhan will participate in the National Institutes of Health Medical Student Summer Research Training Program in Diabetes and Obesity Research at Vanderbilt University. — Yicheng Bao was admitted to the National Institute of Diabetes and Digestive and Kidney Diseases Medical Student Summer Research Program at Washington University. — Comron Hassanzadeh, the 2016 recipient of the Carolyn L. Kuckein Student Research Fellowship, will spend five months at Washington University continuing his research into the use of PET/CT scans to predict clinical outcomes for cervical cancer patients. — Shirene Philipose will work in the lab of Uthayashanker Ezekiel, Ph.D., assistant professor in the Department of Biomedical Laboratory Science at Saint Louis University.